Urban gardening in offbeat settings. 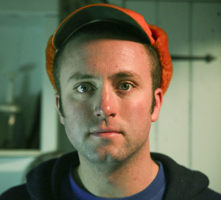 Review of DVD "Truck Farm"
"I was trying to find a way not to lose my lonely mind....I decided what I needed was more vegetables...." sings a plaintive male voice, as filmmaker Ian Cheney wanders through bleak urban scenery. 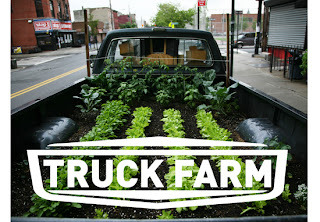 From this somber opening scene, the film "Truck Farm" takes a sharp upbeat turn. What follows is a joyful and info-packed movie about urban gardening....in some very unusual places. I thoroughly enjoyed this odd documentary with its wacky mode of delivery and intriguing cast of characters. The first of those characters is Cheney himself, who grows an organic "farm" in the back of his old pick-up truck in NYC. He creates his garden bed with the expert assistance of "Greenrooter" Victoria Foraker. The two of them explain the various layers laid down between the truck bed and the soil - to keep roots from penetrating the truck, to retain and drain water, and to prevent erosion. The top layers are light-weight soil and garden soil. After planting, Cheney installs a time-lapse camera to capture the lush growth of his truck garden. His customers later in the film include well-known nutrition scientist Marion Nestle and chef Daniel Barber, who both praise the truck's pristine vegetables. I really liked the next entrepreneur profiled in the film, roof-top farmer Ben Flanner - he quit his E-Trade job to take a financial risk on his roof garden. Flanner said he'd been advised by friends to seek more stable employment, but he hoped the roof-top enterprise would be his stability, and planned to take on another roof. The film features a garden on a small barge, as well - "The Water Pod." Four people live on the boat for 6 months at a time, while traveling to 5 locations in NYC. The boat provides all the boaters' food, shelter, water, and showering.Says "Living Systems Director" of the Water Pod, Carissa Carman, "People see it as an avant-garde approach to an oasis. Taking it to a whole new level." 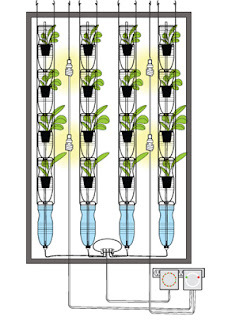 Also interviewed is Britta Riley of "The Windowfarm Project." She introduces viewers to an economical system of pipes, pumps, and 25 plants spanning a vast picture window, a system that can be adapted to any sunny window. In the Red Hook section of Brooklyn, Cheney explores a community farm that occupies a former asphalt playing field. Now the farm generates produce that costs less than a store would charge, and pays a salary to the neighborhood teenagers who tend it. The film is a feel-good experience - the projects are all producing wholesome food for motivated city-dwellers who care about their health. The movie is especially valuable in creating models for under-served urban populations who lack access to farmers markets and other affordable organic-produce outlets. But the film has relevance far beyond the present day and beyond unequal distribution due to retailers locating in prosperous neighborhoods. Here's the bigger picture. When our civilization runs out of oil in approximately 40 years, local food will be a must for everyone. VERY local. We won't have the fuel to truck produce across the country, or even across town. We won't have fuel to manufacture vehicles, or to construct grocery stores, for that matter. We'll have to get creative about how to grow our own food then, especially in urban and suburban settings. I'm glad someone is experimenting with different methods now. I loved this creative and inspirational film. 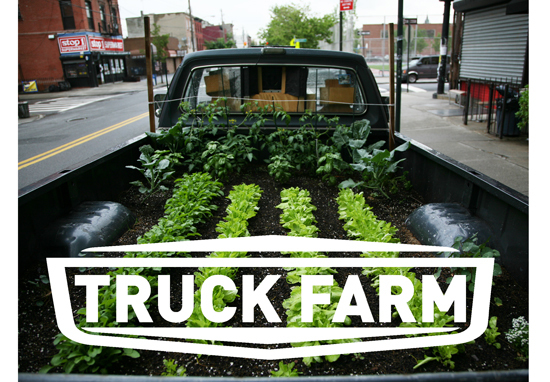 Truck Farm, with its songs and silliness, is a piece of the solution - a piece that will loom larger as the end of oil approaches. I recommend it for classes, families, or general entertainment. The DVD is available from Amazon and from the website. 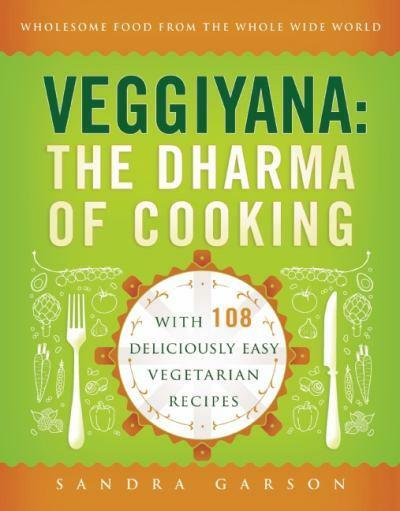 Review of new vegetarian cookbook "Veggiyana: the Dharma of Cooking"
I was asked to review an unusual new cookbook, Veggiyana: The Dharma of Cooking, just released this month. The book by Sandra Garson is a blend of recipes from around the globe and short narratives about the author's food experiences or perspectives. It would be a great gift for someone interested in international cuisine, Zen Buddhism, or the origins of vegetarian staples, such as rice, pasta, and tofu. I like the idea of such an eclectic mix of recipes. Some are simple enough, others more complex. I especially enjoyed Monique's Marinated Mushrooms (from Provence), Piro Aloo: Spicy Potatoes (from Kathmandu), and Volteados: Guatemalan-Style Black Beans. These three were very tasty and fairly easy; they also used commonly-found ingredients. Some recipes in the book have ingredients that could be hard to find, such as pomegranate arils, a daikon, Chinese dried tofu. An adventurous cook might be excited by this, but I'm more of an expedient cook, not very willing to search. If you're vegan, take note that a fair proportion of the recipes in Veggiyana include dairy products, and several require eggs. I imagine plant-based milks and egg-substitutes could be used instead. As for fat, the author makes no claim that the dishes in the book are low-fat, and quite a few do call for several tablespoons of oil, butter, or ghee. I enjoyed reading the passages in the book about the author's travels in Asia, particularly her efforts to improve the diet of malnourished children in a Nepali boarding school and the diet of Buddhist nuns in a Kathmandu abbey. The author is a student of Zen Buddhism and thus the book has a Buddhist flavor, with several one-line quotes from Buddhist teachers about the connection between a healthy body and a healthy mind. But for me, it stops short of actually delivering much Buddhist philosophy beyond the short quotes and the author's good works in the Nepali school and abbey. At least, that's the case with the "abridged advance" version for reviewers that I was sent. At first glance, I assumed that a book with "Dharma" in the title would include lots of guidance (that I need!) on pursuing enlightenment or at least serenity. Something along the lines of "present moment, wonderful moment." I was hoping for tips on how to keep my mind in the present while chopping vegetables, rather than engaging in my usual mind-wandering. My dear friend Therese Fitzgerald, an ordained Zen priest who co-founded the Buddhist church "Dharma Friends," defines Dharma as "the body of teachings of awakening." I don't see much about awakening in my abridged copy of Veggiyana. I do, however, see some promise of guidance in the Table of Contents for the complete book - the version you would get if you bought the book. I see "Perfecting Perception: Chocolate as Dharma Practice" and "Generosity: Learning through Food" - both are one-page essays that sound like insights into right living or healthy thinking. As I read through Veggiyana, struggling to describe it concisely and accurately, I keep thinking of my favorite Zen cookbook, The Tassajara Bread Book by Edward Espe Brown. Ed was the head cook at a Zen monastery in California. This book was first published in the 1970's, but is still offered on amazon.com - a testament to its timelessness. My copy is torn and stained, but I continue to use it because the slim volume cuts right to the chase - no frills, no embellishment. Although there's very little in the book about Ed or Buddhism, it somehow oozes a sense of living and eating simply, savoring the present moment. By its very simplicity, it models simple living. Veggiyana is different, for me, in that regard. Which is better? Ed's book might be better to hang onto for years, might be more utilitarian for cooks. Sandra Garson's book might be better as a gift, perhaps more entertaining for leisurely perusal. I appreciate Garson's efforts to convey her experience of Nepal and the value of wholesome food in living a wholesome life. I like her celebration of the rich variety in foods around the world. I do recommend this book, especially for those who already have a number of cookbooks. With its mixture of narratives and foreign recipes, this cookbook is unlike any others I've seen. 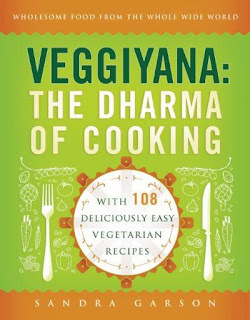 Veggiyana: The Dharma of Cooking will be available from Amazon in paperback on September 27, just in time for some early holiday shopping. Review of documentary "PLANEAT: Nothing changes the planet as much as the way we eat"
Carnivores, take heed! The film "PLANEAT" might convince even the most passionate meat-enthusiasts to lay off the stuff. This DVD makes a strong case that our love affair with meat and dairy is ravaging both our planet and our bodies. The filmmakers used extensive interviews with highly credible health and environmental experts (interspersed with cool vegan-cooking scenes) to illuminate the damages inflicted by the livestock sector and our own misguided food choices. Having co-authored a book on the same subject myself, I appreciated the filmmakers' skill in cramming a lot of convincing info into a very watchable film." The strength of the movie, for me, is the breadth of its coverage in addressing different angles of the meat-consumption issue. My husband Ken teaches biology/ecology and is always on the lookout for new tools to use in class to make the point that the livestock industry has a huge environmental and climate impact. The United States is the world's worst offender - we eat much more meat per capita than any other country. And as PLANEAT will tell you, eliminating animal products from your diet will prevent more greenhouse gas emissions than switching to the most fuel-efficient car on the market. This film will be a useful teaching tool for progressive educators, to replace John Robbins' excellent 1991 film "Diet for a New America" - which is aging (although still accurate). PLANEAT is obviously current and features a number of young, pierced, tattooed chefs in the cooking segments. The two films overlap, in that both feature the research of Dr. Colin Campbell, a researcher from Cornell who conducted a landmark study relating disease frequencies to the consumption of animal products. In this study, menus of meat and dairy were implicated big-time as culprits in not only vascular and heart disease, but also numerous cancers. The research is reported in the 1990 publication "Diet, Lifestyle, and Mortality in China: a study of the characteristics of 65 Chinese counties" by Colin Campbell, Richard Peto from Oxford University, and two Chinese scientists. The work is also summarized in the 2005 book The China Study by Colin Campbell and his son Thomas Campbell. PLANEAT includes interviews with Peter Singer, famed author and ethicist at Princeton University. In the film, Singer gives voice to moral concerns regarding animal abuses on factory farms. He also points out ethical concerns in our contributing to rising sea-levels that will drown farmers in developing nations - sea-levels that are rising as a result of livestock-related greenhouse gases. I applaud PLANEAT not only for its broad scope, but particularly for its very detailed review of health effects. I learned a few things I didn't know, even after years of reading and reporting in my own books and blogs. For me, though, the scariest down-side to meat-eating is its destructive effects on the rapidly declining welfare of our green planet. PLANEAT did address some environmental repercussions of livestock, but could have done so more stringently. For example, the film omitted the most significant eco-research I know of: "Livestock and Climate Change" by Richard Goodland and Jeff Anhang, environmental specialists with the World Bank Group. After a meticulous analysis, Anhang and Goodland reported that the livestock sector is responsible for 51% of greenhouse gas emissions! In other words, our eating of animal products is the primary cause of global warming! Surely their meticulous and widely-cited analysis is worth a mention. The film also didn't address depletion of marine fishes by overharvesting - a topic certainly pertinent to a film on the consumption of animal products. I would've liked to see a word, too, about the massive amount of water required to raise food for livestock, a growing concern as global water shortages escalate. All filmmakers are limited by viewing time, and the thorough coverage of disease and reversal of disease by meatless diets perhaps merited these omissions - that's all a matter of personal perspective. Overall, I highly recommend PLANEAT as an important educational tool for teachers at any level, for parents and families, for environmental clubs or medical organizations, and for the enlightenment of any individual who cares about health, longevity, and solutions for our ailing planet. PLANEAT will be released for home, educational, community, and theatrical use in October 2011 from Bullfrog Films. For more details about that, please contact Stephanie at stephanie@bullfrogfilms.com or (610) 779-8226. Meanwhile, you can watch the film right now on the PLANEAT website. "New studies: cancer linked to milk consumption"
"New studies: Fast food "kids meals" loaded with calories and fat"
"Livestock account for 51% of annual worldwide greenhouse gas emissions"
"New study: meat impacts climate more than buying local"
"Is local food the greenest choice? New study says no"
"Earth Day: 3 things you can do"
"Review of new food film 'What's on YOUR plate?' "
"Review of the documentary 'End of the Line: where have all the fish gone?' "